I really enjoyed Colson Whitehead's memoir about the time he spent playing in the World Series of Poker, but almost a month after finishing it, I'm having a hell of a time articulating why. Whitehead freely admits he isn't that great of a poker player—his greatest advantage seems to be his deadpan expression, a hard-to-read poker face he presents to the world all the time, not just at the card table. When a magazine agreed to bankroll his entry fee in the tournament, he wasn't in a great place in his life, newly divorced and a little aimless professionally and creatively. He spends a good chunk of page space talking about how dreary his life was at the time. How is that fun reading? I've concluded that what it comes down to is Whitehead's voice. He's so dry and witty, and while he may complain at times, he always does so with an ironic glance in the mirror first. He knows he's a little bit of a sad sack, and if he laughs at himself first, it gives us permission to laugh too. Just be warned, his humor is very much on the cerebral side. It's not the kind of word play that causes spit-takes. It's the kind that makes you smile, slyly, with just one side of your mouth. If you have a mustache to twirl and a cat to pet, you could do those things too. I personally have spent more time than I care to admit watching televised poker tournaments. I was in college when Texas Hold 'Em exploded in popularity, and you could waste hours upon hours of your day watching poker “celebrities” on ESPN trying to outwit and outbluff each other into the big money. I also played in a home game for a while, and was bad enough to think I was pretty good. 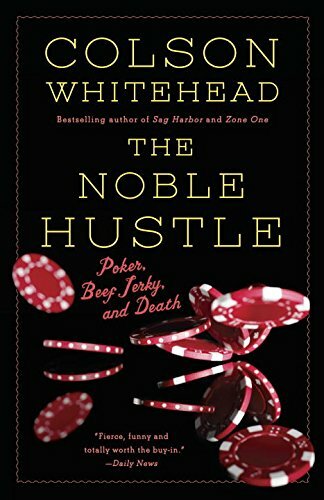 So I recognized a lot of the names Whitehead dropped in the book, which was kind of fun but also kind of sad, to think how many brain cells I've used up on something like poker. Based on this book, I think that's pretty much how Whitehead feels about his poker experience, too. I know I'm becoming a broken record when it comes to audio books, and if that's not your thing I totally respect that, but this is yet another book where the audio version really added to my enjoyment. First of all because Whitehead has a lovely deep voice and is a fantastic reader, but also because his sardonic vocal tone perfectly matches the tone of the book. They're his words, after all, and he knows exactly how to deliver them for maximum—yet deadpan—effect. I think some of the jokes are subtle enough that they could fall flat if you just read them off the page without knowing much about Colson Whitehead or his darkly funny outlook on life. 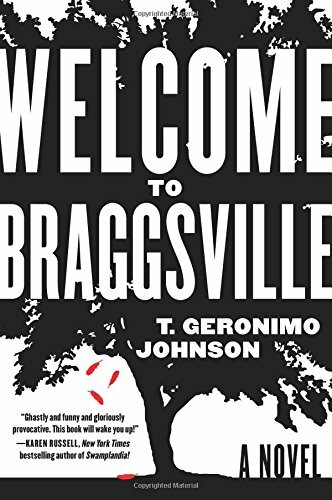 Welcome to Braggsville was such a challenging book for me, in both subject matter and style. Every time I thought I'd figured out who Johnson was satirizing—Confederate flag-waving Southerners, hyper-liberal yet clueless Berkeley professors, young and dangerously naïve narrator D'aron and his friends—I'd turn a page and he'd expose yet another group's flaws and foibles. If everyone is a “bad guy”—or at least complicit in some way—who are the good guys in this story? I wondered. The answer I finally settled upon: there aren't any. And that's why I think this book is one of the most painfully honest about race relations in America that I've ever encountered. D'aron Davenport, a white kid from Braggsville, Georgia, population 712, escapes the rigid confines of his hometown for the vibrant campus of UC Berkeley. His two very different worlds collide with a bang when he and three friends decide to stage a “performative intervention” at Braggsville's annual Civil War reenactment. The idealistic but misguided co-eds think they'll be confronting racism and forcing the town's residents to reconsider an outdated ritual, but their stunt goes horribly wrong. The rest of the book consists of D'aron and his friends struggling to make sense of what happened and dealing with their own culpability. Their inner reflections and conversations with others make for some pretty uncomfortable reading—the irony is so thickly layered, it's sometimes hard to know who, if anyone, can be taken seriously. The style Johnson has chosen doesn't help clarify things, either. He flits at will from one character's perspective to another, switches from first to second person and back again like water sloshing in the bottom of a boat. I could tell I was missing so many tiny details and passing references; all I could do was keep my feet planted and hope some of it would soak up into my socks and maybe someday make it to my brain. It's a hell of a challenge, but Welcome to Braggsville is all the more important for it. I'm glad I stretched myself and didn't give up. Now, though, I think I've earned a light and fluffy read or ten.